Every preschool kid needs a pair of bunny ears! These are easy to make. Don’t get hung up on making them “perfect,” because this is a great chance to practice cutting and gluing skills. What You Need: white cardstock; pink cardstock or construction paper; glue; staples. How to Make It: Cut two strips of cardstock about 2 inches wide and staple together. Adult can help child wrap the strip around his or her head to see how long the band should be. Trim and staple. Cut two long, pink ear shapes and two white ear shapes that are a little larger. Glue pink to white and staple ears to band. 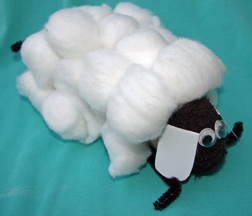 For Easter, a farm unit or anytime, try these handprint (traced hand) sheep. One version (that’s Mom’s big ‘ol hand on the left) uses cotton balls for the fleece while the other (there’s Alec’s cute little hand) uses popcorn. What You Need: Black construction paper; glue; white crayon; googly eye (optional); pencil; scissors. How to Make It: Trace around hand and cut out. Position so fingers face down (these are the legs and the thumb is the lamb head). 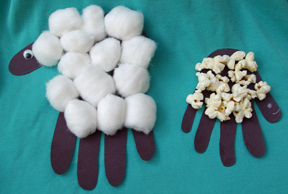 Use glue to cover “palm” with cotton balls or popcorn. Use white crayon to draw in eye and mouth, or use googly eye. Two dessert-sized paper plates are just the right size for little hands. 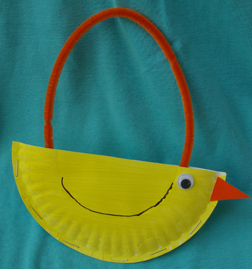 Let preschoolers decorate their bunny however they’d like. 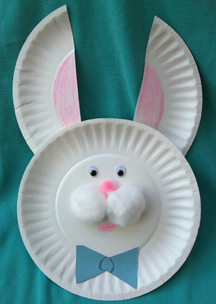 What you Need: 2 dessert-sized paper plates; 2 cotton balls; small pink pom pom; 2 googly eyes;Â black marker; pink crayon; scissors; glue; small piece of scrap cardstock or construction paper (for bow). How to Make It: Cut one of the paper plates in half and color in with pink crayon on the inner part of each plate. Glue to back of other plate to form ears. Glue cotton balls and pink pom pom to center of other plate for muzzle and nose. Glue on eyes. Color in mouth with pink crayon. 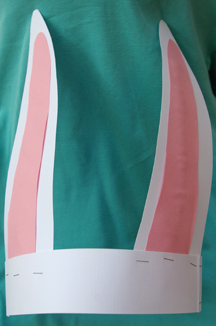 Cut out tie shape from cardstock and glue on.